Tucked in the far southwestern corner of Utah, the expansive desert landscape of Red Cliffs National Conservation Area marks the zone where three ecosystems merge: the Mojave Desert, Great Basin, and Colorado Plateau. Covering roughly 45,000 acres of public land with 130 miles of non-motorized trails, the preserve offers a rugged environment ripe for adventure. We’ve hand-picked some of the area’s best hikes, mountain bike trails, and one-of-a-kind outdoor experiences to create the ultimate guide for a weekend spent exploring the quiet beauty of Red Cliffs. With so many miles of trail to explore, narrowing it down to the best hiking adventures in Red Cliffs proves no easy task. For a well-rounded look at the best this desert landscape has to offer, check out these must-do trails. Gaze out in any direction from this trail and you’ll see the impressive sandstone formations that typify southern Utah. Swirling layers of red and orange rock form narrow canyons and hollowed out chambers line the cliff walls. This 3-mile out-and-back route winds through sandstone gulches and up a few short, but sandy, hills on the way to the namesake Babylon Arch, shortly before the trail’s turn-around point at the Virgin River. Hiking through the sand and few trail markers along the way can make the path tough to follow, but the solitude and scenery are worth the effort. 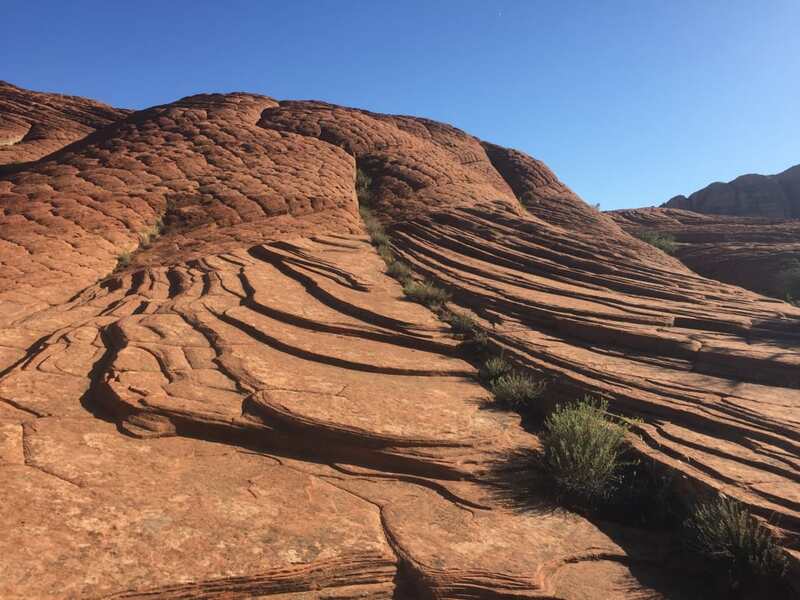 Situated eight miles north of downtown St. George, this 4-mile out-and-back trail takes you into a world of slickrock dunes with a fascinating checkerboard pattern. The trek starts with relatively easy hiking in a meadow of sagebrush and desert grasses before the moderate uphill section takes you right through the Yellow Knolls for which the trail is named. For a longer excursion, connect the Yellow Knolls hike with the Winchester and Black Gulch trails for a strenuous, 6-mile loop. 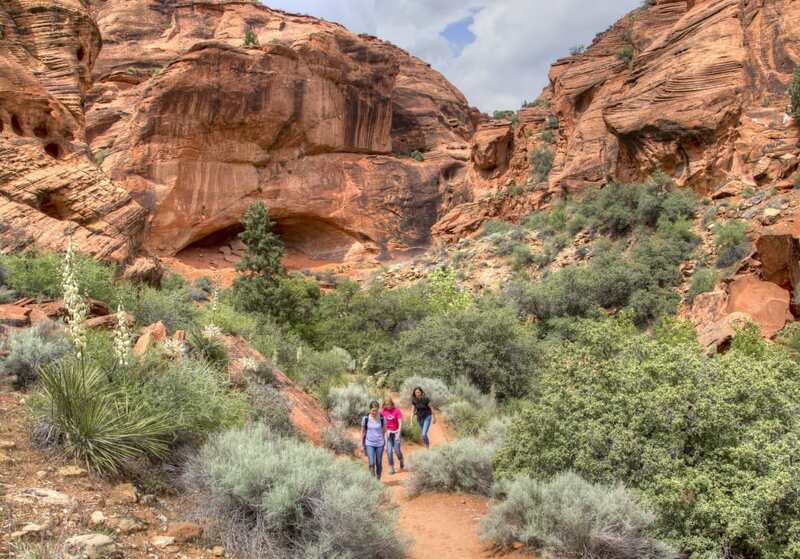 The Red Cliffs Nature Trail is an easy way to explore one of Utah’s red rock canyons. Also known as the Red Reef Trail, this hike showcases many of the quintessential charms that draw visitors to southern Utah. Glorious red rock canyons complete with waterfalls and pools, a pristine creek lined with vibrant cottonwood trees, and caverns painted with ancient petroglyphs all combine to make this hike a classic. Suitable for all ages, this easy 2-mile trail starts at the Red Cliffs Campground about 15 miles northeast of St. George. Whether on your own or as part of a guided excursion, mountain biking is the perfect way to explore the unparalleled beauty and solitude of Red Cliffs. St. George and several smaller towns in Washington County—like Springdale, Virgin, La Verkin and Hurricane—offer everything you need to set tire to dirt, from bike rentals to gear shops to qualified guides. Here are a couple of the best rides you’ll find in the conservation area. If you’ve only got time for one trail here, go for this one. An excellent introduction to slickrock singletrack riding, this intermediate, 9.5-mile loop serves up incredible views of sandstone bluffs, snow-capped peaks on the horizon, and a few dinosaur tracks thrown in for good measure. For a longer ride, add on the easy to intermediate, 7-mile (one-way) Prospector Trail. Strong riders comfortable with rocky climbs and descents will get their kicks on the 4.6-mile (one-way) Broken Mesa Rim Trail. Located 10 miles north of St. George in Red Cliffs Desert Reserve, this heart-pumping ride can be linked up with some dirt road and singletrack climbing for an adventurous 15.5-mile loop, known as the Broken Mesa Loop Trail. Also located in the quiet beauty of Red Cliffs Desert Reserve, this upper-intermediate ride features 6.8 miles of sustained downhill, descending nearly 2,000 feet. Technical terrain toward the end will challenge your skills on rock-strewn singletrack. Run a shuttle with two vehicles, or ride back up the dirt Cottonwood Road back to the trailhead for an 18-mile loop. There is plenty to do during a weekend at Red Cliffs National Conservation Area. A trip to Red Cliffs National Conservation Area is the perfect opportunity to try new outdoor experiences in a remarkable desert setting. Unique adventures like soaring above Snow Canyon’s multi-colored peaks in a hot air balloon or navigating scenic backcountry roads on a guided Jeep tour are just a few examples of the opportunities available in Red Cliffs. Rock climbing and canyoneering top the list of thrilling excursions in the area, with options to explore with local guides or to go out on your own (if you have the experience!). 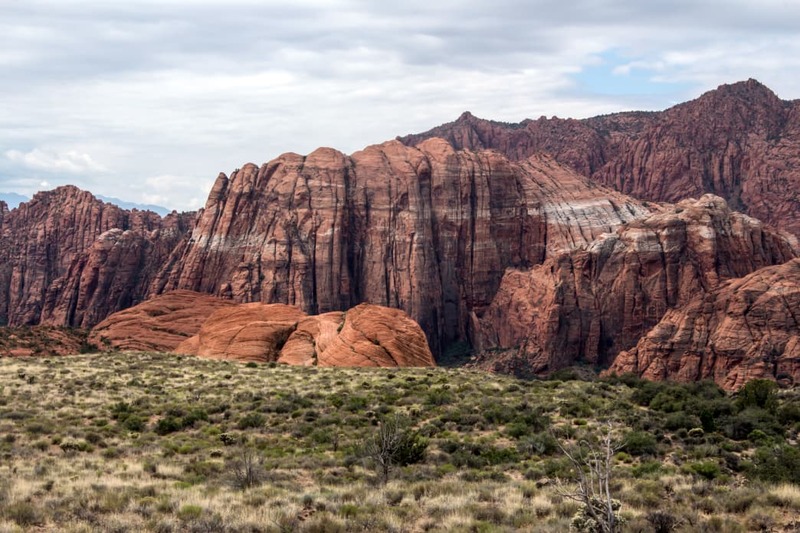 Snow Canyon State Park—which lies just northwest of St. George and is mostly encompassed within Red Cliffs National Conservation Area—features the highest concentration of established rock climbing routes in the region as well as several intriguing canyoneering spots. Like most of southern Utah, spring and fall are the best times of year to explore Red Cliffs. Pleasant temperatures and few rainy days make these seasons ideal for hiking, biking, camping and other outdoor adventures. Note that the rivers, waterfalls, and canyon pools are most vibrant in the spring before the warm temperatures of summer start to dry things up. High temperatures during the peak of summer usually reach into the upper 90s or low 100s, while winter in St. George and the surrounding area stays relatively mild with average highs in the mid-50s. The city of St. George, with a population just over 80,000, makes the ideal base camp for a weekend of exploring Red Cliffs National Conservation Area. From full-amenity resorts to cozy villas to secluded campgrounds, there’s a fitting place to lay your head for every type of adventurer. When looking for a hotel in St. George, you’ll find most of the familiar names in hospitality, like Courtyard Marriott, Best Western, Holiday Inn, and Hilton. Additionally, St. George has several boutique resorts and hotels that offer a distinctly local feel with enviable vacation packages, such as Amira Resort and Spa and Inn on the Cliff. Nearby Ivins, Utah, is home to Red Mountain Resort, another option for guests who seek luxury accommodations with spa and retreat packages in the area. Condo and villa rentals around St. George strike a nice balance between indulgence and relaxed comfort for a weekend trip. Popular choices like Red Sands Vacation Properties, The Inn at Entrada, and Ledges Vacation Rentals make it easy to find your home away from home, southern Utah style. In the heart of town, St. George RV Park and Campground is an ideal option for those who appreciate the convenience of a central location while still enjoying their evenings of chilling and grilling out beneath the trees. Sixteen miles northeast of St. George, the Red Cliffs Campground offers a small, simple place for tents or RVs set amongst impressive sandstone canyons and the peaceful Quail Creek. Campers who call this place home for the weekend will enjoy easy access to some of the area’s main attractions, including Red Cliffs Nature Trail, the Dinosaur Tracks hiking area, and the Red Cliffs Anasazi Site. No matter where you stay, you’re just minutes away from some of the most beautiful country in southern Utah. It won’t take long to see why the Red Cliffs National Conservation Area is one of the state’s real gems. Written by Jenna Herzog for RootsRated Media in partnership with St. George Tourism. The St. George area is often touted as the gateway to Zion National Park, and that’s true—it’s quick and easy to get to this iconic national park from St. George. But there’s so much more to southwestern Utah than its proximity to Zion. 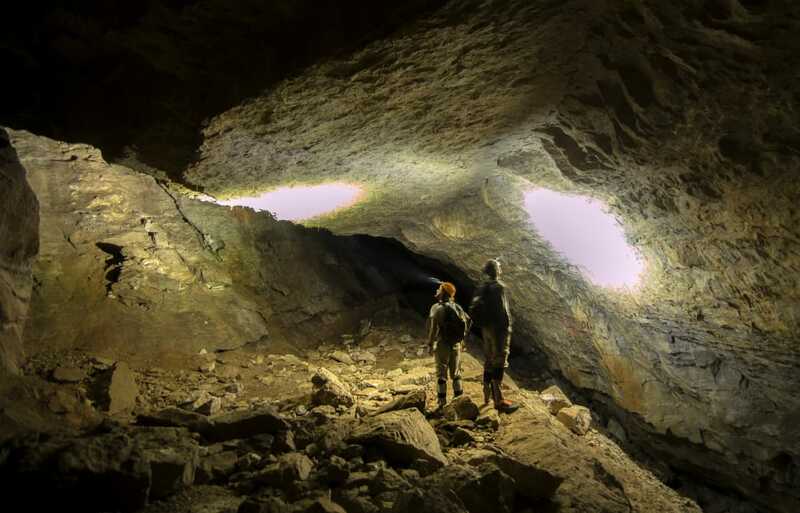 This slice of Utah is filled with adventure possibilities, ranging from mountain biking and hiking to sports you may not have tried, like spelunking, rock climbing, and stand-up paddleboarding. Next time you’re headed to St. George, sure, plan to spend some time exploring Zion. But add these must-do adventures to your list for thinner crowds and plenty of bang for your buck. Bikes aren’t allowed on any of the dirt trails inside the national park (you can ride on the paved Pa'rus Trail), but you can definitely get your fill of off-road riding at nearby Gooseberry Mesa, just west of Zion. The singletrack trails here are world-class, and best suited for adventurous intermediate and advanced riders (beginners can head out the main dirt road on the mesa, but will end up doing some hike-a-biking on the actual trails). Gooseberry doesn’t have much sustained climbing on its 13-ish miles of trail—it’s more like short bursts—but boasts flowy singletrack, roller slickrock, and wide-open views for days. 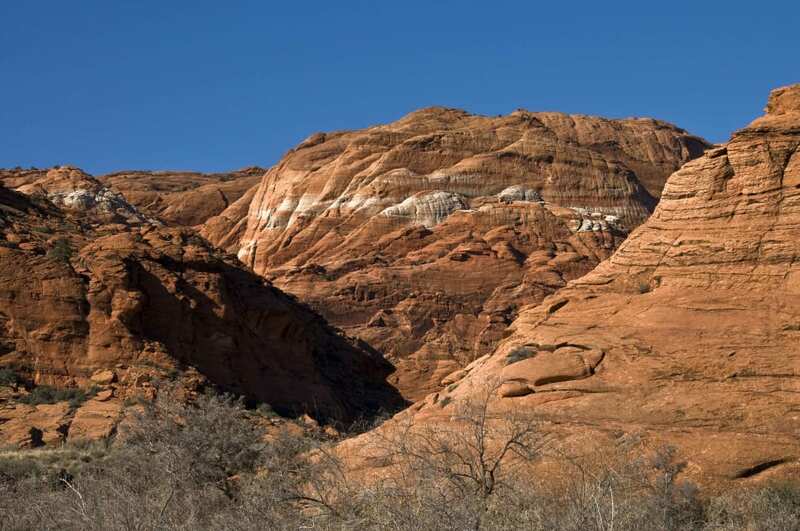 Snow Canyon State Park is known for its ancient lava flows. Snow Canyon State Park’s name might sound odd for a park in the middle of the desert, but it rarely sees much snow; instead, it’s named for Mormon pioneers Lorenzo and Erastus Snow. One of the best ways to see the park’s towering Navajo sandstone cliffs and ancient lava flows is on horseback. It doesn’t hurt that this landscape was the backdrop for classic Western films like Butch Cassidy and the Sundance Kid, making it extra-enticing to take in the views as the cowboys did. Several outfitters offer equestrian tours of the park, making it easy to see Snow Canyon from a saddle. Utah’s next door neighbor, Colorado, gets lots of attention for its 300 annual days of sunshine, but southwestern Utah boasts the same statistic. With all those bluebird days, there are plenty of opportunities to climb rocks in and around St. George, and the area delivers, whether you’re looking for sport climbing, bouldering, or trad. Black Rocks is an ideal destination to get your feet wet with St. George-area climbing since it’s got a handful of each route type. There’s also the Chuckawalla Wall, which is all sport climbing (and with routes that go at 5.10 and above, it’s a destination for once you’ve gotten a feel for the area’s grades). Climbing here is best done in the shoulder seasons and winter months when it’s cooler—both crags get plenty of winter sunshine. Bloomington Cave stays at a comfortable 58 degrees year round. This limestone tectonic cave system is considered one of the best caves to explore in Utah, and it’s the only BLM-managed cave in the St. George area that’s open to the public. Bloomington Cave also has the distinction of being an ambient 58 degrees Fahrenheit year round, so it’s a great place to escape the desert heat during the warmer months. There are five routes to choose from, and each will require some tight squeezes and climbing on slippery surfaces. Don’t forget your headlamp and you’ll need to obtain a free permit from the BLM Field Office in St. George before you visit. Southwestern Utah is a beloved road cycling destination, and you’ll hear a lot about the cycling tours of Zion National Park. But there’s plenty of cycling to be had on roads outside the park, too, including the paved loop in Snow Canyon, which is accessible right from St. George. The doubletrack paved loop covers a total of 18 miles, though there are numerous spur roads and side trails to explore if you’re so inclined. You’ll also get a fair amount of climbing in: expect a little over 1,000 vertical feet, mostly in a series of steep, rolling pitches. The impressive lava tubes at Snow Canyon State Park are an excellent hiking destination. Trekking out to a lava flow sounds like something you could only do on an island in the Pacific, but landlocked Utah has some tricks up its sleeve, too. Snow Canyon State Park boasts both ancient lava tubes and petrified sand dunes, and you can explore both in a 4.3-mile mind-blowing hike. Begin on the Lava Flow Trail, which starts off Snow Canyon Road. The trail meanders past a handful of lava tubes, which you can scramble into and check out, and eventually spits hikers out on West Canyon Road, which intersects with the Petrified Dunes Trail. Half a dozen campgrounds in Dixie National Forest make it easy to extend a day trip into a whole weekend, and if your core needs a break from all that paddling, you can take advantage of the reservoir’s hatchery-fed fishing. 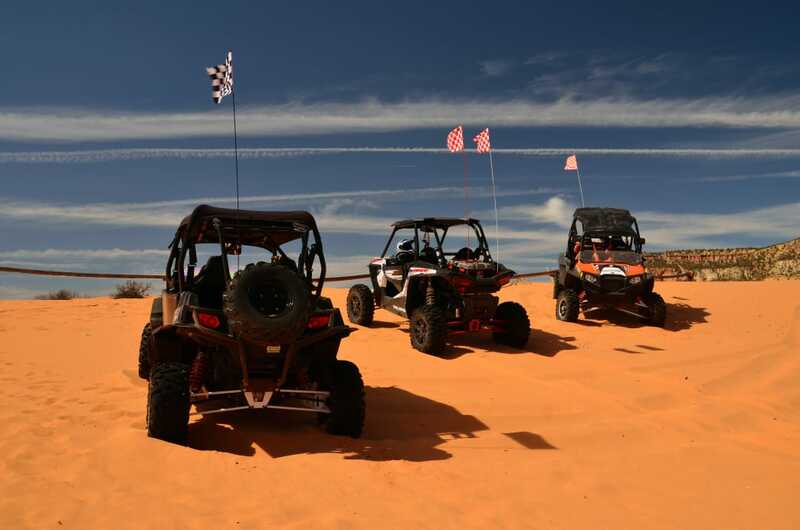 Coral Pink Sand Dunes State Park features 2,000 acres that are open to off-road vehicle use. The spectacular pink-colored dunes of Coral Pink Sand Dunes State Park were formed by the erosion of the surrounding sandstone cliffs, and though there’s an interesting geology lesson there, they make for an even better (and much faster-paced) adventure. The dunes can move as much as 50 feet each year, making for ever-changing conditions. About 2,000 acres of the park are open to off-road vehicle use, and if you don’t own your own ATV, you can sign on with an experienced outfitter who will get you on four wheels. You’ll also have a chance to see slot canyons, petrified dinosaur tracks, and other desert wonders along the way. Quail Creek Reservoir is fed both by Quail Creek and the Virgin River, and it’s easily accessible from St. George. Quail Creek State Park is home to some of the warmest waters in Utah, making it a top-notch spot for anglers to fish for rainbow trout and bass, along with catfish, bluegill, and crappie. Save time by purchasing your Utah state fishing license online before you head out to the park. Ready for a break from the fishing? Rent a SUP or other craft right there at the state park, then retire to a gorgeous campsite with red rock views at the end of your day on the water. If you’re training for an endurance event, chances are you’ve spent a lot of time planning for every contingency: what you’ll wear, what you’ll eat, how long each leg of your race will take, and so forth. All those things are important, but when you’re competing in an endurance event in the high desert—whether it’s the True Grit Epic, the St. George Marathon, a half-Ironman, or a challenge of your own design—you’ve got a few added elements to consider. Racing in the desert is incredibly rewarding, in part because the environment is so unlike any other. But this landscape comes with its own set of possibilities for which to prepare. The climate is, of course, hotter and drier, and weather changes quickly. Navigation can be challenging, and there’s the unpleasant feeling of sand in your shoes to contend with. If you’re considering signing on for an endurance event in St. George, plan ahead for these desert-specific concerns. Conventional wisdom has it that if you’re exerting yourself in the desert in the more moderate temperatures of spring and fall, you’ll need to consume three to five quarts of water per day. That’s if you’re hiking or backpacking—if you’re running a marathon or otherwise pushing your body to its limits, you’ll need more water. That’s part of the reason you’ll need to carry more water than you might think. Consider using a bladder and hose, which make it easier to drink frequently than stopping to pull out a water bottle. Most organized endurance events have aid stations where you can refill and refuel, but don’t count on those to be the only time you’re eating and drinking. Arrive a few days before your event to give your body time to acclimate to the dry climate, and spend those days drinking enough fluids so you’re hydrated well in advance (no need to overdo it, however, as you can go too far with this strategy where it actually hurts you). On race day, carry enough water to get you from one aid station to the next without bonking. In order to stay hydrated, Gust says, you’ll need more than plain old H2O to stay hydrated. The amount of salt your body loses over the course of a day in a hot, dry climate means it’s essential to replace electrolytes as you exercise, too. There are a number of ways to replenish electrolytes, which are essential to some of your body’s most basic automatic processes. Salty foods like chips and pretzels, which are frequent long-distance aid-station fare, are great for replacing those salts. There are also tons of mixes, powders, and tablets on the market—each have qualities to recommend them, but the most important thing is making sure a specific supplement works for you. Play around with timing and amounts before you arrive for your event, and know that you may need to increase frequency when you’re actually in the desert. Bring your chosen electrolyte replacement with you so you’re guaranteed to have what you need out on the course, even if aid stations aren’t stocked with your preferred brand or flavor. When you spend as much time outside as it takes to train for a long-distance or multi-day event, it’s more important than ever to take care of your skin. Even a short day out without high-enough SPF can have brutal consequences, and that phenomenon only increases in the desert, where the sun will likely be beating down on you all day with little shade for cover. For an 8-plus-hour day in the desert, sunscreen alone simply won’t cut it. You should reapply often, especially vulnerable areas like your face, the back of your neck, and your hands as often as is feasible (at every aid station, if you can) and use SPF-50 or greater. You should also cover as much of your skin as possible, says Gust. “UPF clothing and sunscreen is a must when dealing with the heat in the desert,” she explains, adding that “arm sleeves that can be dipped in cool water can be very beneficial.” A hat with a wide brim will keep your eyes and face from bearing the brunt of harmful UV rays. You may not think you have particularly sweaty feet, but when they’ve been carrying you through the desert all day, things may look a little different. When sun bounces off sand, it can easily heat up to 120 degrees Fahrenheit or hotter during the warmest parts of the day, not to mention that it’ll likely make an appearance in your shoes. With this in mind, you may want to consider running gaiters or something similar to keep sand out of your shoes and be prepared to deal with blisters early and often. Think about carrying a pared-down blister-repair kit (even if it’s just some duct tape on your trekking poles) and stop to fix address hotspots as soon as you notice them. Problems with your feet can escalate quickly in the heat. Weather in the desert often changes quickly and without much prior warning, and it doesn’t help matters that you’re unlikely to find anywhere safe to take shelter in the event of a storm. With that in mind, check the weather forecast carefully not only for possible storm events in the immediate vicinity, but also in the area surrounding your destination, since a storm upstream can easily cause flash flooding miles downstream. Always avoid camping in washes, and if you’ll be traveling in narrow canyons or washes are unavoidable, plan your escape route well in advance. It won’t take much time in the desert to discover one of its universal truths: Sand gets in everything. It finds its way through the mesh in your shoes, under your hat, into your teeth. Some of this is preventable, like using running gaiters to prevent tons of sand from seeping into your shoes, wearing shoes with more Gore-tex material and less mesh, and choosing sunglasses that wrap around your face rather than leaving the sides open to blowing sand. Yes, an endurance event in the desert adds another layer of complexity. But that’s also what makes the challenge fun. With a little preparation, that medal hanging around your neck at the finish line will feel all the sweeter. Zion National Park is one of Utah’s Mighty Five national parks and (for good reason) many people travel to the state to see its natural wonders, but southwestern Utah offers so much more for outdoor enthusiasts. Surrounding St. George are four superb state parks—Quail Creek, Sand Hollow, Gunlock, and Snow Canyon—all offering gorgeous scenery and plenty of ways to enjoy nature, including hiking, camping, fishing, boating, photography, cliff diving, and swimming. These parks are great alternatives to the busier national park, particularly on weekends and during Zion’s high season. Expect low entrance fees, uncrowded trails, plenty of wet and wild water sports, starlit campgrounds, and breathtaking scenery. Here’s just a taste of what you can expect. 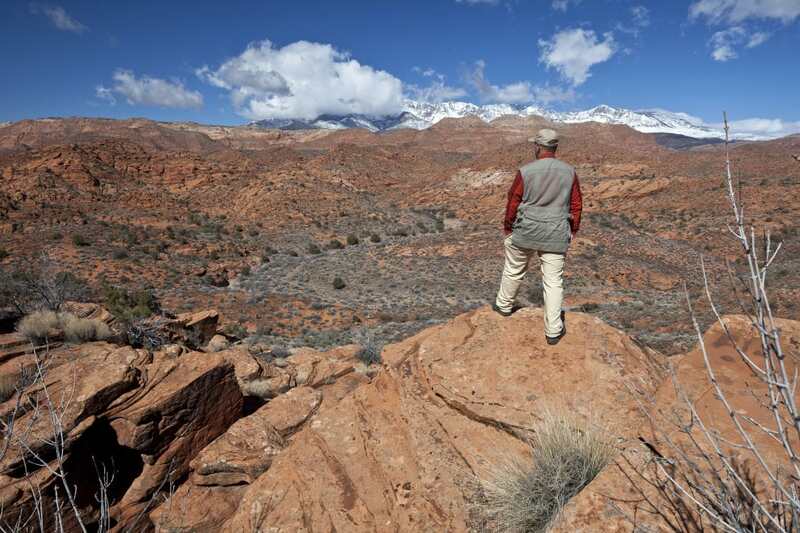 Snow Canyon’s dramatic scenery offers a rugged hiking experience. Snow Canyon State Park is southwestern Utah’s best-kept secret. The park’s magnificent landscape features a 5-mile-long canyon flanked by soaring cliffs. You'll find national-park quality views on the 38 miles of hiking trails, plus a visitor center, campground, and diverse wildlife including desert tortoises, Gila monsters, and peregrine falcons. Snow Canyon, named for pioneers Lorenzo and Erastus Snow, offers a natural beauty that’s just as gorgeous as Zion 50 miles to the east, but without the crowds. The 4,700-acre park, lying north of St. George, is easy to visit and the entrance fee is far less than Zion. Snow Canyon is, like Zion and Bryce Canyon, a textbook in geologic history. The canyon cliffs, composed of burnt red and cream sandstone, are the petrified remains of 180-million-year-old sand dunes, while more recent volcanic cinder cones and lava fields scatter across the higher elevations. The park also hides rock art panels created by the ancient inhabitants, including petroglyphs at Newspaper Rock and Sinking Ship boulder. Get acquainted with Snow Canyon by driving the canyon road from Highway 18, passing scenic overlooks and the visitor center. To really see Snow Canyon’s wonders, head out on a park trail to explore the sandy canyon floor, cliff-lined side canyons, and stone mountains like Island in the Sky. Hikes range from short strolls to hardy backcountry adventures. Best easy hikes are the 0.5-mile Jenny’s Canyon to a sculptured canyon and the 0.5-mile Pioneer Names Trail which climbs to an alcove filled with pioneer names written in axle grease. Longer hikes include the 3.5-mile Three Ponds Trail and 4-mile White Rocks Trail to Lava Flow Overlook. For big adventure, take on Arch Canyon, a canyoneering trek down slot canyons, or climb technical routes on the vertical Circus Wall. There are also equestrian trails and a paved 3-mile walk and bike trail. Get an early start on hot days and always bring plenty of water, sunscreen, and a hat. After a day of hiking across swirling sandstone slabs, discovering petroglyphs, and photographing Snow Canyon’s dramatic scenery, head to the park campground for a quiet night under starry skies. The 35-site campground offers tent and RV sites, accommodating trailers and RVs up to 40 feet, and modern restrooms with showers. Blue Quail Lake is the main attraction at Quail Creek State Park. Quail Lake, a sprawling 600-acre lake in the Quail Creek State Park, fills a valley northeast of St. George. Filled from the Virgin River, the lake is home to some of Utah’s warmest water, making it a paradise for water lovers and fishermen. Surface temperatures climb well above 70 degrees in the summer, but the lake reaches depths of 120 feet so rainbow trout thrive in its deeper water. Quail Lake is also surrounded by reefs of tilted sandstone, flat-topped mesas, and the towering Pine Valley Mountains. You’ll have breathtaking views in every direction. Powerboats and jet skis zoom across the water, making waves and pulling water skiers. The lake is a perfect destination for paddle craft with kayakers and stand-up paddlers gliding across the glassy water in early morning. If you want to get in on the fun, you can rent a paddleboard or kayak at the park. Swimmers find coarse sand beaches along the lake’s edge, but don’t forget water shoes or sandals for beach walking. Fishermen hope to catch big rainbows lurking in the depths or haul in 5-pound largemouth bass, crappie, bluegill, sunfish, and catfish. There are also a few solid mountain biking trails south of the lake, including Rhythm and Blues, a 2.5-mile roller coaster, or the Boy Scout Loops. After a fun day, settle into the park’s campground on the western shore. It offers 23 campsites with shaded tables, modern restrooms, tent sites, and pull-through and back-in sites for RVs up to 35 feet long. 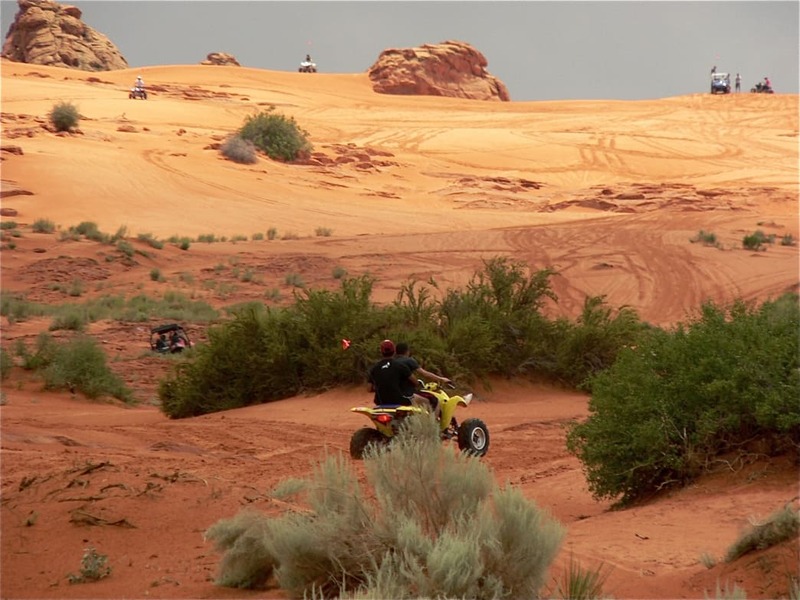 ATV riders flock to the 6,000 acres of terrain at Sand Hollow State Park. 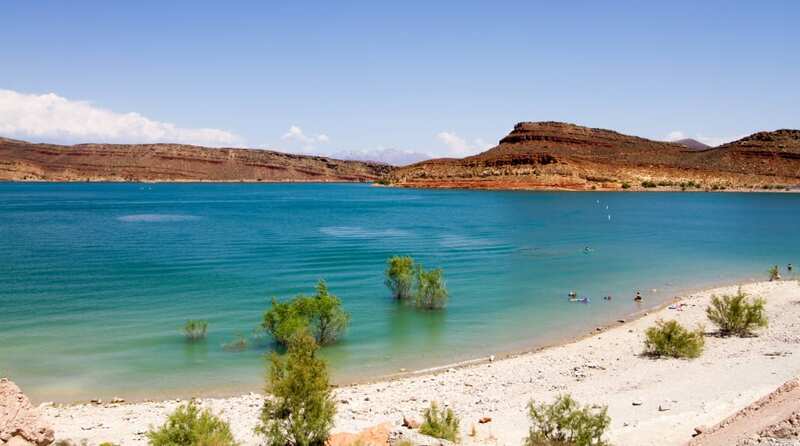 Sand Hollow Reservoir, the centerpiece of 20,611-acre Sand Hollow State Park, offers a mini-Lake Powell experience with a 1,322-acre, turquoise-colored lake surrounded by red sandstone formations. It’s only 15 miles east of St. George and is a veritable playground for outdoor adventurers. Boaters, anglers, swimmers, and paddlers enjoy watery fun on the lake while off-highway vehicles (OHVs) explore 6,000 acres of windswept sand dunes and technical trails on Sand Mountain. Sand Hollow offers year-round excitement, but it is most popular for water sports in the summer thanks to the lake’s warm surface temperatures. Off-road riders will have better weather in the off-season when temperatures cool (summer heat on the dunes reaches over 100 degrees). Most visitors spend time on the lake, twice the size of nearby Quail Lake, to explore its sandstone islands, red sand beaches, quiet coves, and open water. Fishermen cast lines from the shoreline and boats for catfish, crappie, bluegill, and trophy bass. The lake is perfect for boating, with motorboats towing water skiers, wakeboarding, sailing, and calm water for paddling. Kayakers, canoeists, and stand-up paddlers enjoy exploring the shallow water around a rock island or dipping oars in the shallows along the south shoreline. A red beach on the lake’s southwest corner has warm water for swimming and fine sand for building castles. Sand Hollow Reservoir is the best place for cliff diving, with daredevil jumpers plunging off cliffs into deep water on the northwest shore. Besides offering outdoor adventure, Sand Hollow State Park makes an ideal basecamp for exploring the nearby state parks as well as Zion National Park’s wonders, which lies 45 minutes away. The park’s two campgrounds—Sandpit and Westside—offer 75 campsites, many with full hook-ups, as well as tent and group sites, restrooms, and showers. Gunlock State Park is a compact 548-acre parkland nestled in a scenic valley northwest of St. George. Gunlock Reservoir, fed by the Santa Clara River, is a 266-acre lake surrounded by dusty mesas rimmed with cliffs and eroded sandstone bluffs. The park, less visited than Quail Lake and Sand Hollow parks, offers a quick getaway with a small campground, fine fishing, water sports, and waterfalls, a unique sight in the desert. Don’t expect Gunlock, named for settler Will “Gunlock” Hamblin, to have the same facilities as the bigger state parks. Instead, the park is primitive with a small campground, a single boat ramp, and a beach. Gunlock’s best attraction is the overflow channel below the dam. Clear lake water dashes down salmon-colored sandstone cliffs, forming a whitewater cascade and several waterfalls that empty into deep pools in late spring. The calm, warm-water lake is ideal for paddle sports, with rocky coves to explore in kayaks, canoes, and stand-up paddleboards. Walk across the dam to the swimming beach and to explore natural caves hollowed in sandstone cliffs. Swimmers also dunk in the emerald pools below the waterfalls, while anglers find good fishing for crappie, bluegill, and bass in the lake. It’s best to fish from a dory rather than the shoreline, which is steep and hard to access. The state park offers a five-site campground for overnight guests to park an RV or pitch a tent. Expect peace and quiet in the primitive campsites—and bring your own water. Written by Stewart Green for RootsRated Media in partnership with St. George Tourism. Best known as a gateway city to Zion National Park, St. George in southwestern Utah is a year-round playground for outdoor enthusiasts. With its red rock canyons, sandy rolling landscapes, and the Virgin River just awaiting your next adventure, St. George is a great place to try out a new sport. There are also plenty of cultural and indoor entertainment options to keep you busy when the occasional thunderstorm rolls through. Here are five things to try on your next family vacation here—or at least your first one, as you’ll never get to all of this in one trip! In this preserve, try the Babylon Arch Trail, where the sandy, open terrain transports you to another planet. It’s only a mile and some change, but as long as you time your hike to avoid the peak heat of the day, it’s very manageable for all but the youngest members of the family. Elephant Arch offers a longer, sandier hike of almost four miles. If the kids want to dabble in a little of Southern Utah’s famed canyoneering on a path that’s still just over a mile long, head to the Red Reef Trail, where they can do some scrambling as you hike. If you want to make a day of it and really get your hike on, the Red Reef Trail is part of the Cottonwood Canyon Wilderness System (allowing you to do an almost 6-mile loop). 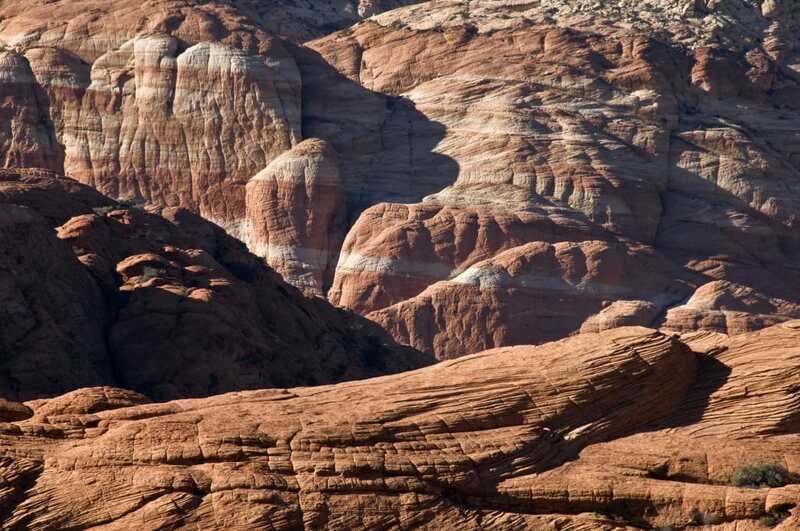 Discover the red rocks of Snow Canyon State Park without the crowds found in Zion. One of the most intriguing hikes in Snow Canyon is the Pioneer Names Trail, where, yes, you can observe the names etched into the rock by early Mormon pioneers. (If graffiti is old enough, it becomes historic.) The north trailhead to the site provides the closest access, but it’s a short trail either way. You can also hike to the petrified dunes in Snow Canyon, which is located in the center of the park, offering amazing views of the cliffs. If you want a taste of Zion National Park without the crowds, Eagle Crags is your go-to destination. (Note that you’ll need a vehicle with good clearance to get to the trailhead near Rockville.) At Eagle Crags, you not only get the panoramic views Zion delivers, but the variety of landscapes, too, as the trail ascends from desert to juniper groves to the top the canyon. 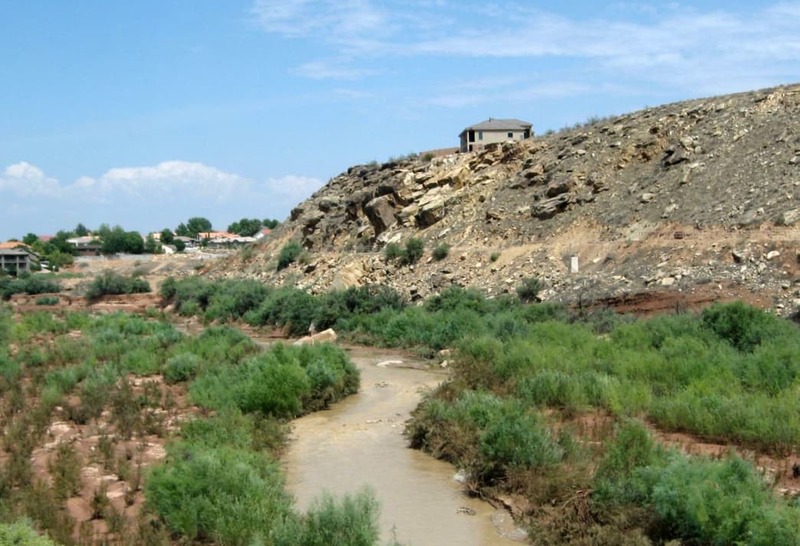 Dixie Red Rock, also known as Pioneer Park, features impressive views of St. George. If you’d prefer to stay closer to town where you can easily haul your picnic and gear, head to Dixie Red Rock, a.k.a. Pioneer Park, overshadowing St. George. Climbers love the place, but the hiking is easily accessible, too, with the added bonus of BBQ pits, picnic tables, and a shade pavilion. The greater St. George area has more than 60 miles of bike paths and literally hundreds of miles of off-road singletrack and slickrock trails. Beginner mountain bikers should head to Barrel Roll, which is as fun as it sounds. Located in the Santa Clara River Reserve, Barrel Roll delivers views and twists and turns without being too steep to handle. From there, advance to the Wire Mesa Trail, located just outside Zion. This singletrack is more mountainous (with a bit of shade as a bonus) and offers incredible views. If your crew is filled with experts, you have a slew of picks. The most epic is undoubtedly Nephi’s Twist at Hurricane Cliffs, a steep, technical track that will test any serious rider. And don’t forget about the state parks for mountain biking bliss: Snow Canyon State Park is a good option (just double check to see on which trails mountain biking is permitted). St. George’s Dinosaur Discovery Site at Johnson Farm offers visitors a glimpse into prehistoric times. 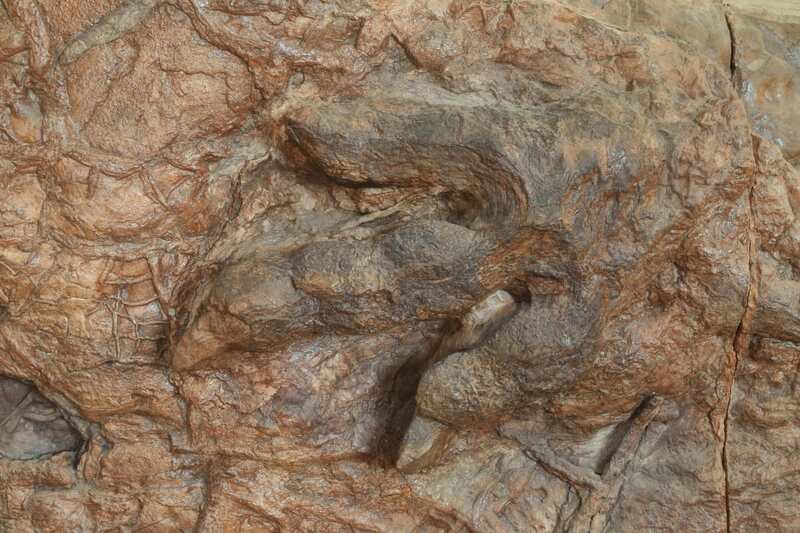 Whether you have kids who are nuts for dinosaurs or are interested in paleontology and the natural world, the early Jurassic dinosaur tracks at St. George’s Dinosaur Discovery Site at Johnson Farm will impress every member of the family. Walk where dinos have walked at the museum in St. George, then pair the experience with the Rosenbruch Wildlife Museum nearby. The somewhat eclectic collection here showcases more than 300 animal species from habitats as near as Southern Utah and as far as the African Savannah. If you have kids in tow, the St. George Children’s Museum is your next stop, where they’ll have the run of 12 rooms of hands-on exhibits to lose themselves in imaginative play. Save this gem for a hot day or an afternoon activity after a morning hike or bike ride. The Virgin River is a great spot for cooling off on a hot day. It may come as a surprise, but there is actually plenty of water in Southern Utah! The Virgin River cuts through the red rock landscape, providing the perfect way to cool off. Yes, the river gets crowded with tourists tubing in Springdale and the Narrows draws a crowd in Zion each summer (for good reason—it’s epic) but to escape the masses, head to Falls Park, also known to the locals as Sheep Bridge. You’ll get a mile of riverfront property for your day, complete with sandy beaches and perfect jump-off rocks (always be sure to check depth before jumping). Families can find shallow pools for kids, and the more daring can find rapids to ride. Want more space to yourself? Hop in an SUV and bump your way along a dirt road to Toquerville Falls, where an easy hike lands you at the base of a desert oasis. You’ll want your camera ready for these cascading falls over the rock, but make sure you enjoy a dip, too. Not up for such a physical challenge? Head to Fiesta Fun, the family fun center that offers every game you could want, plus laser tag, mini golf, go karts and the like. 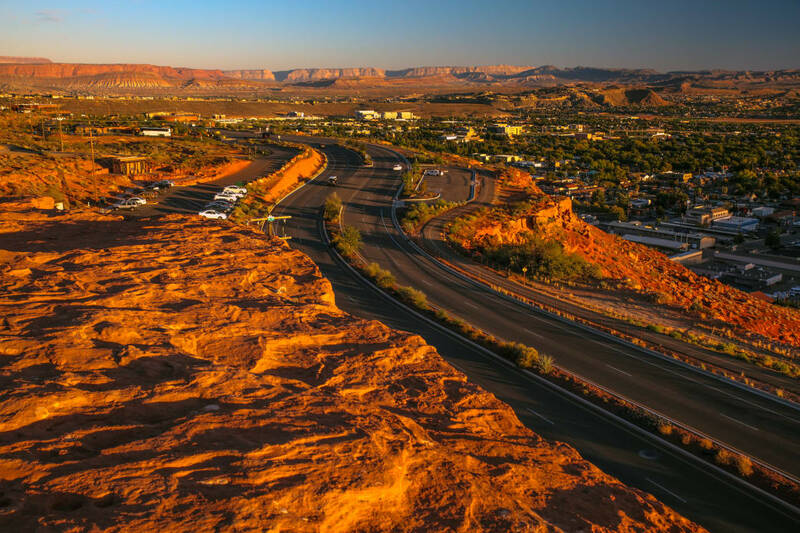 Whether you have young kids or adventurous teenagers, you’ll have no problem finding plenty of ways to enjoy a getaway to St. George. Exploring this unique part of the country with the family will provide memories to last a lifetime. Written by Amy Whitley for RootsRated Media in partnership with St. George Tourism.